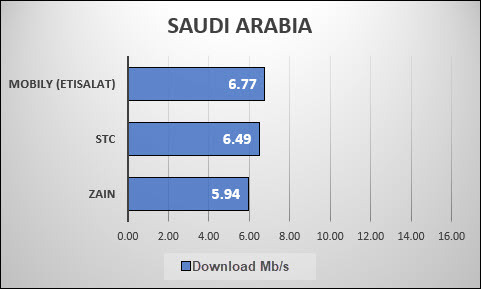 In this analysis of speed test results taken in countries in the Middle East during February 2019 we compare download speeds between countries, between MNOs & ISPs within each country and also compare how performance varies across different subsidiaries of the major Telecom Groups. 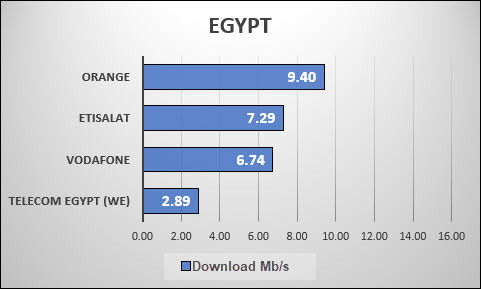 Regional average download speed is 7.3 Mb/s. 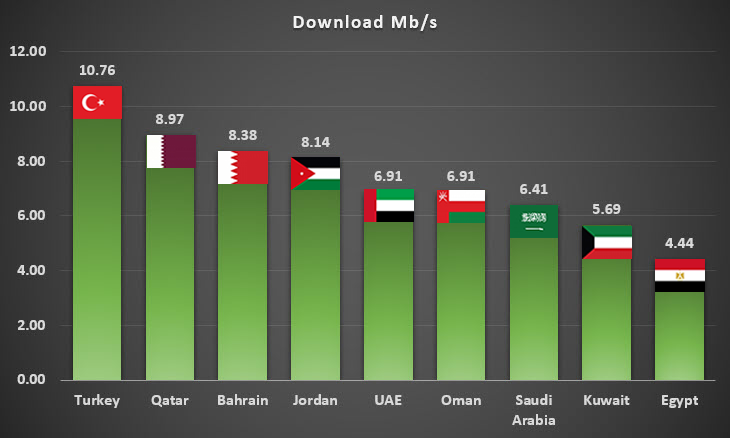 Turkey (10.7 Mb/s), Qatar (9.0 Mb/s), Bahrain (8.4 Mb/s) and Jordan (8.1 Mb/s) top the chart with above Middle East average download speeds. 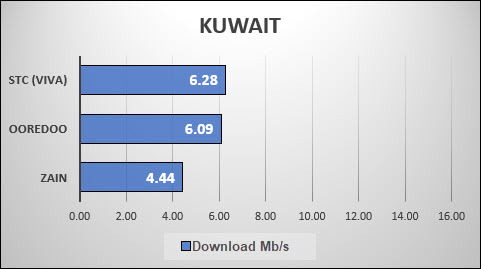 Egypt (4.4 Mb/s) and Kuwait (5.7 Mb/s) have the poorest performance in our tests. These speeds are represented in the following chart. Our next chart superimposes the average speed for each country with the speeds for each Telecom Group so that we can see which Groups produce above or below average in each country that they operate in. Each country is given a unique colour in the following chart to allow a visual comparison of speeds for different Telecom Groups in each country. In this section we look at how the most popular MNOs & ISPs perform in each country. The charts are in order of the fastest available download speeds with a consistent scale of up to 16 Mb/s to make comparison easier. 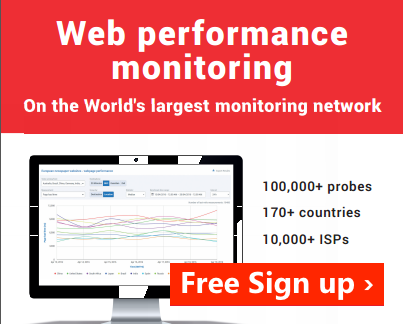 SpeedChecker collected data in all countries during the same period in February 2019 to ensure a fair comparison. We gathered many data points using the crowd sourced data samples collected in the field on mobile devices. During the time the data collection took place, SpeedChecker received over 60,000 data samples and the included statistics and analysis are based on this dataset. It was important for us to not only measure the real speeds as experienced by the user but also to ensure that we measured to the same point to ensure a fair comparison. For this we included only measurements to one server in Amsterdam. Read the following section “Choice of measurement server” for more about this method. Every measurement methodology differs in the selection of measured server infrastructure. Some methodologies focus on on-net servers hosted in telecom premises and others focus off-net. SpeedChecker believes off-net servers’ measurements are representing real user experience better than on-net as most of the content accessible by end users lies off-net. Most of the content these days is hosted on CDN networks and the best way to measure most relevant download metrics is to choose popular CDN networks. However, as we learn in this report, not all ISPs and MNOs connect to CDNs directly (or peer) and that has major implications on performance. 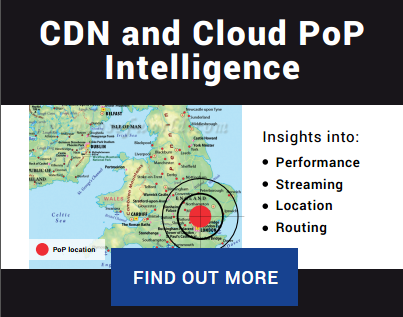 One of the main advantages of CDN peering is to improve connection time and download speeds by bringing the content closer to the end user. Before we could analyse the speed results, we considered how widespread peering was and discovered that there was a variation between 0 and 100% use of local servers. The chart above shows the percentage of results from each country that are routed via local Middle East Servers, Europe or Asia. 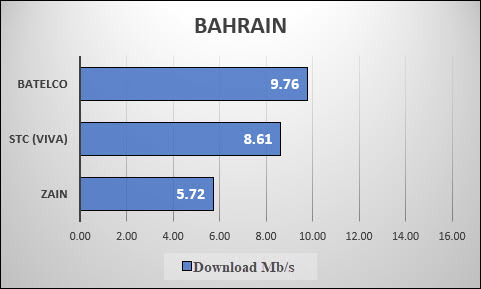 Bahrain, Qatar and Oman are all above 50% Middle East server use with Bahrain at 100%. 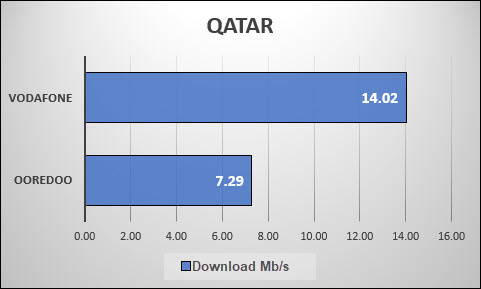 United Arab Emirates and Egypt have a very low use of local servers. In our case we have used the most popular CDN – Cloudflare. Speeds achieved to local servers were, on average, around 30% faster than speeds routed via European servers but this is not available to the majority of users. Because of the unbalanced availability of this CDN peering we chose to limit our analysis to results from one particular server based in Amsterdam, Europe. It is acknowledged that the operators in some countries that are peering with CDNs will achieve better results than those shown in this report.